Precision Cylinder Welding PowerSeal USA’s NikaSeal plating is a nickel composite layer with silicon carbide particles impregnated for added hardness, increased durability, and superior lubrication. NikaSeal has excelled under the most extreme conditions by users ranging from weekend warriors and grass roots racers to top-level National and World Championship competitors. Leading engine builders, performance tuners, and factory race teams depend on NikaSeal to deliver the performance and reliability required to win. Precision Cylinder MeasurementsPowerSeal USA’s manufacturing facility, equipment, procedures, and personnel enable us to handle a broad range of cylinder services — from a standard replate to big bores to major welding and machining reconstructions. 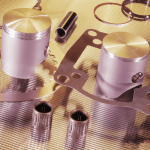 If your OEM plating has worn, we will replate and hone to tighter tolerances than new, and if you supply a piston or purchase one from us, we will custom fit the new bore diameter. 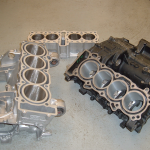 For big bores, we require a piston, either provided or purchased, to ensure the proper fit. Please note that overboring often times requires additional modification to the head and powervalves; all services provided by PowerSeal USA. Nicks, gouges, broken skirts, detonation, o-ring grooves, and the worst damage imaginable can all be repaired with our custom welding and machining capabilities. 1. Serial Number coding – enables job tracking and quality data collection. 2. Stripping and cleaning – existing plating is removed and grease/oil/dirt are removed from the cylinder. 3. 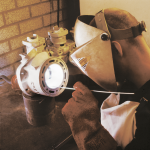 Mechanical/repair- any welding/boring/machining operations are completed. 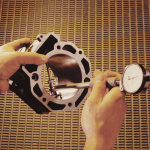 Cylinder bores are measured and checked to ensure they are the round, straight, and the proper diameter prior to plating. 4. Plating- the NikaSeal layer is applied through a proprietary electroplating process. 5. Diamond Plateau Honing- this honing technique provides the exact bore dimensions, tolerances, and surface finish demanded by high-performance engines. 6. Port chamfering and finish machining. 7. Inspection and final cleaning. We constantly refine our manufacturing processes and technologies to provide our customers with the highest quality, best performing, and most durable cylinder repair available. The plating prep and bath chemistry are tested and adjusted daily, providing optimum, consistent results. A state-of-the-art, proprietary system developed by PowerSeal USA monitors and controls the electroplating process enabling customization of manufacturing parameters for each cylinder. Multiple Cylinders RepairedOur technicians utilize honing equipment and tooling from the recognized industry leader in the field. Our honing stones are the highest quality diamonds available. We were not satisfied with the standard honing materials available, so we developed our own. The measuring tools used to check fit and finish are calibrated daily ensuring precise fit and exact tolerances. We take tremendous pride in all aspects of our workmanship, quality, and finish. Our attention to detail ensures that your reconditioned cylinder delivers peak performance and longevity.